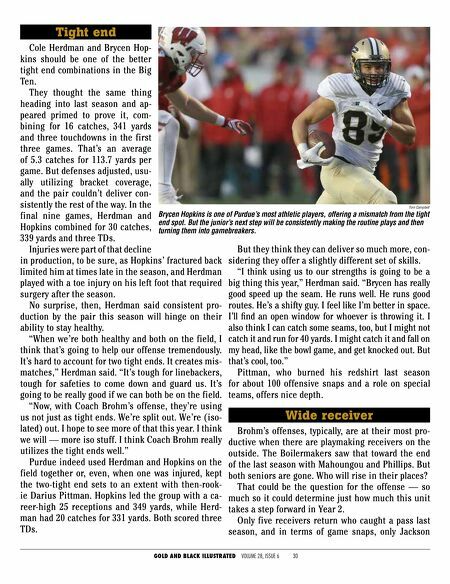 GOLD AND BLACK ILLUSTRATED VOLUME 28, ISSUE 6 30 Tight end Cole Herdman and Brycen Hop- kins should be one of the better tight end combinations in the Big Ten. 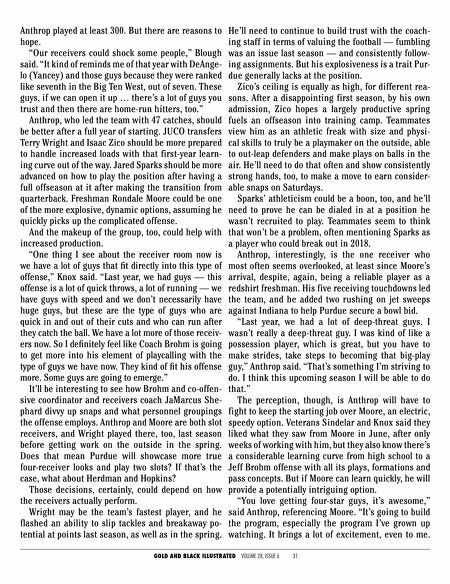 They thought the same thing heading into last season and ap- peared primed to prove it, com- bining for 16 catches, 341 yards and three touchdowns in the first three games. That's an average of 5.3 catches for 113.7 yards per game. But defenses adjusted, usu- ally utilizing bracket coverage, and the pair couldn't deliver con- sistently the rest of the way. In the final nine games, Herdman and Hopkins combined for 30 catches, 339 yards and three TDs. Injuries were part of that decline in production, to be sure, as Hopkins' fractured back limited him at times late in the season, and Herdman played with a toe injury on his left foot that required surgery after the season. No surprise, then, Herdman said consistent pro- duction by the pair this season will hinge on their ability to stay healthy. "When we're both healthy and both on the field, I think that's going to help our offense tremendously. It's hard to account for two tight ends. It creates mis- matches," Herdman said. "It's tough for linebackers, tough for safeties to come down and guard us. It's going to be really good if we can both be on the field. "Now, with Coach Brohm's offense, they're using us not just as tight ends. We're split out. We're (iso- lated) out. I hope to see more of that this year. I think we will — more iso stuff. I think Coach Brohm really utilizes the tight ends well." Purdue indeed used Herdman and Hopkins on the field together or, even, when one was injured, kept the two-tight end sets to an extent with then-rook- ie Darius Pittman. Hopkins led the group with a ca- reer-high 25 receptions and 349 yards, while Herd- man had 20 catches for 331 yards. Both scored three TDs. But they think they can deliver so much more, con- sidering they offer a slightly different set of skills. "I think using us to our strengths is going to be a big thing this year," Herdman said. "Brycen has really good speed up the seam. He runs well. He runs good routes. He's a shifty guy. I feel like I'm better in space. I'll find an open window for whoever is throwing it. I also think I can catch some seams, too, but I might not catch it and run for 40 yards. I might catch it and fall on my head, like the bowl game, and get knocked out. But that's cool, too." Pittman, who burned his redshirt last season for about 100 offensive snaps and a role on special teams, offers nice depth. Wide receiver Brohm's offenses, typically, are at their most pro- ductive when there are playmaking receivers on the outside. The Boilermakers saw that toward the end of the last season with Mahoungou and Phillips. But both seniors are gone. Who will rise in their places? That could be the question for the offense — so much so it could determine just how much this unit takes a step forward in Year 2. Only five receivers return who caught a pass last season, and in terms of game snaps, only Jackson Tom Campbell Brycen Hopkins is one of Purdue's most athletic players, offering a mismatch from the tight end spot. But the junior's next step will be consistently making the routine plays and then turning them into gamebreakers.